As a child Harry (Brandon Maggart) is equally horrified to discover Santa Claus (his father in a costume) groping his mother and later that the real Santa Claus does not actually exist. As an adult Harry works in a toy factory that makes cheap toys. His home is filled with Christmas decorations and he desperately tries manufacturing the magic of Christmas that he lost as a child. As the adult world grows increasingly awful, Harry snaps and begins to think he’s really Santa. After painting his van like a sleigh, making a Santa Claus costume, and stealing toys from work. Harry sets out to bring gifts to the children and the blade of a hatchet to the adults. “You Better Watch Out” is about the slow destruction of man desperately trying to hold on to the one thing in his life he enjoyed. It’s a smartly written film; Harry’s spiral into madness is awful and fascinating. He’s a complete wash-out as a human being but he’s still less awful than his brother or any of his co-workers. 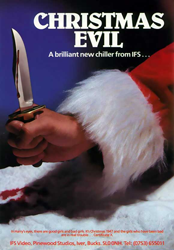 The film generates some real tension when you see him amongst the public disguised as Santa Claus and you’re not sure whether he going to be handing out gifts or splitting skulls. The whole look of the film captures what it’s like in a long winter filled with dirty grey snow. The final moment of the film is a marvelous turn that is both unexpected and perfect.